A project that was first awarded funding through Innovate for Good has gone on to win an addtional $100,000 grant. On June 18, 2015 Rose Community Foundation celebrated its 20th Anniversary, both a reflection of the past 20 years of working to enhance the quality of life of the Greater Denver community, and an announcement of nine winners of the new project, Innovate for Good. Rose Community Foundation created Innovate for Good, a venture to find and fund new, innovative projects to make the Greater Denver community a better place to live earlier that year. During its first cycle, Innovate for Good received nearly 400 entries from local nonprofit organizations, engineers, artists, neighborhood associations, teenagers, retirees and others, who answered the question, “What new and innovative idea would you bring to life to make the Greater Denver community a better place to live?” Among those entries, was one called Fresh Food Connect. After a team of 130 community members reviewed and rated applicants’ ideas, a smaller group of Foundation staff and other leaders guided the Innovate for Good project and served as judges of the finalists’ implementation plans. Wendy Hawthorne, the executive director of Groundwork Denver was among the nine winners selected and just fourteen months ago, stood on stage as one of three winners vying for an additional grant prize through a live vote to 350 in attendance. The then pilot stage application (app) called Fresh Food Connect was designed by a collaboration of partners including Groundwork Denver, Denver Urban Gardens and Denver Food Rescue to feed families and reduce food waste by providing income to low-income youth by allowing home gardeners to donate extra produce for distribution at food banks and through affordable sale. This project aimed to connect gardeners to youth who would pick up and deliver donated produce using bikes and trailers. 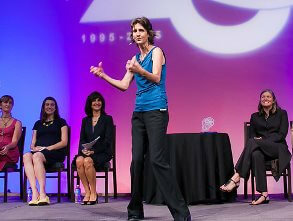 Wendy Hawthorne pitches her idea at our 20th anniversary celebration. Just one year later, Wendy found herself standing on a different stage, this time with her partners Turner Wyatt of Denver Food Rescue and Rebecca Andruszka of Denver Urban Gardens. A state with over 120 members and community supporters eager to hear presentations from the nonprofit finalists who were selected through a rigorous grant review process to present how they would use $100,000 to create transformative change in the community. 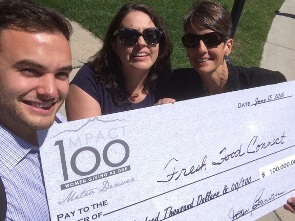 The Impact100 Metro Denver is a local giving circle that brings together 100 women who each make a $1,000 donation, with the goal of affecting transformational change in our community. Using their Innovate for Good video and some coaching from Tim McCraken, head of acting at the Denver Center for the Performing Arts, and one of the other Innovate for Good winners, Wendy and her team won the inaugural award that night. Fresh Food Connect now plans to expand out of their service area into the Greater Denver community and are asking that everyone help them spread this good work. Visit FreshFoodConnect.org and enter your zip code. If you live in the current pick-up area, you will be asked to fill out a complete profile. If you live outside of our pickup area, you will be asked to leave your email address so they can contact you when they expand to your area.